Happy Mother's Day to all moms! I miss my mom and I know she'd curse me again serving this year's election because like all protective moms, she never wanted to worry about me. I love you Mama! So, I arrived at my precinct (clustered precinct 1297A-Brgy. Holy Spirit, Government Complex, QC) at 8am and all the election supervisors were all there. I greeted my co-teacher moms "Happy Mother's Day". I was startled to see what preparations the community had done for tomorrow's election and this is what I've seen. 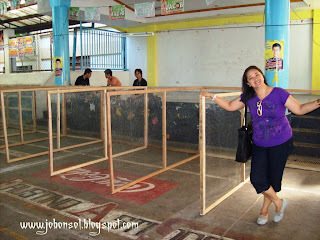 The precincts looked like a chicken cage and it was too small. The election supervisors informed us of the early distribution of honorarium for BEIs and we were all excited to line up. 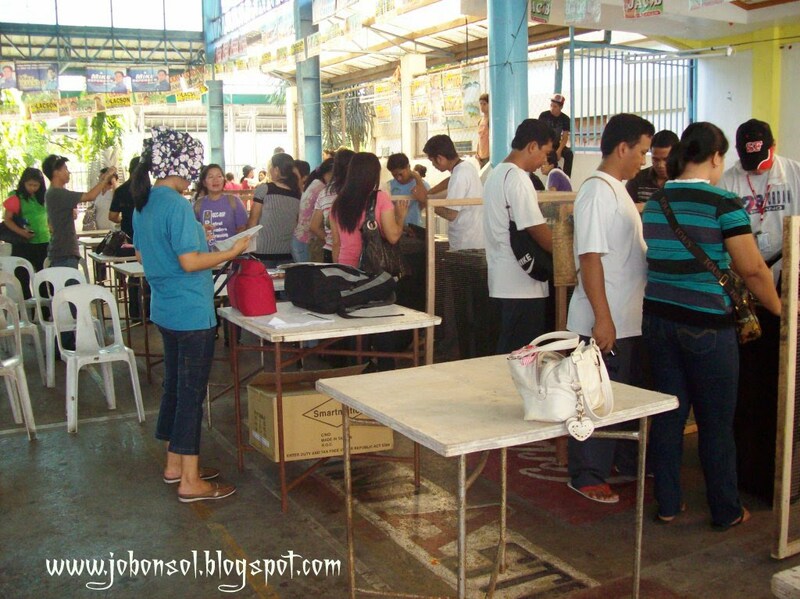 Poll watchers and barangay kagawads were signaled to set up tables and chairs to prepare for the testing and sealing of PCOS machines. 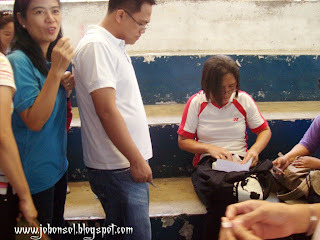 So with the General Instructions provided by Comelec, we followed the procedure, opening the box, checking if all materials in the list tally with what was inside the boxes and set the machines up.Present in this event was Ferly,a young employee from Smartmatic (one against 8 clustered precincts-that's 8000 voters tomorrow)ABS-CBN, TV5, pollwatchers and barangay officials when we unpacked and tested the machines for intialization of counters, open voting and re-zeroing of counters to ensure the machines are set to zero before sealing it for tomorrow's big day. The scorching heat of the sun may not contain the patience of voters to line up and wait for their turn tomorrow because the covered court was hot and humid.All machines were tested passed and all pollwatchers with the Smartmatic girl gave a go-signal to seal after closing of all polls. Everyone was happy with the turn-out of results. a. Most voters are not well informed that the ballot is extremely sensitive. Sweat or any liquid, fold or simple scratch may make the ballot invalid. Since there is no convenient space to mark the circles, the voter may opt to use any surface that may discard it. My mother (although she cannot vote here) may be one of those who may find the ballot so confusing with too many names and candidates and she may shade more than what was required. The pollwatcher from PPCRV who joined us today shaded 13 out of 12 ballots and the machine read nothing from the senators line up and she was disappointed. If the voter did not follow instructions well from the ballot, the votes will not be counted. Really a waste of time and effort. I can imagine how the provinces will fare in the same situation. b. Ballots rejected by the PCOS to be manually read by the Comelec may be debatable as to considering how to count especially those that shaded more than what was required or shaded improperly. I wonder how the Comelec will resolve this manual counting. It made me realize the previous elections will be more convenient to our majority fellow less-educated fellowmen because the ballot in the manual elections simply allots the name of the candidate. It will take a longer time to proclaim the elected politician with this new system otherwise the people will totally be in outrage after realizing that Comelec will only proclaim politicians who garnered votes from transmitted results. c. The procedures of the BEI will always be distracted by the pollwatchers and further prolong the election reports. The pollwatcher assigned in my precinct today prolonged the procedures by interrupting the steps lacking knowledge of the PCOS software system. She thought re-zeroing of counters may be printed not knowing initialization reports happen after the click of open voting tab in the PCOS machine. I hope she remembers what we practiced today by tomorrow. 2. Mobilization of 8000+ voters in a small narrow covered court like this may be so difficult because of the poor coordination of security systems in the area to help the BEIs conduct elections.This may also be a similar scenario or worse in other areas. I am summoning the heavens that all voters may be gentle and patient in voting in our precinct tomorrow considering the complicated tasks assigned to the BEI. My mother may follow Mommy Dionisia Pacquiao in rosary if she reads this post. Happy Mother's Day and may God bless us all!